EUR is under pressure due to the election matters in France and the possibility of Fed rate hike in March. 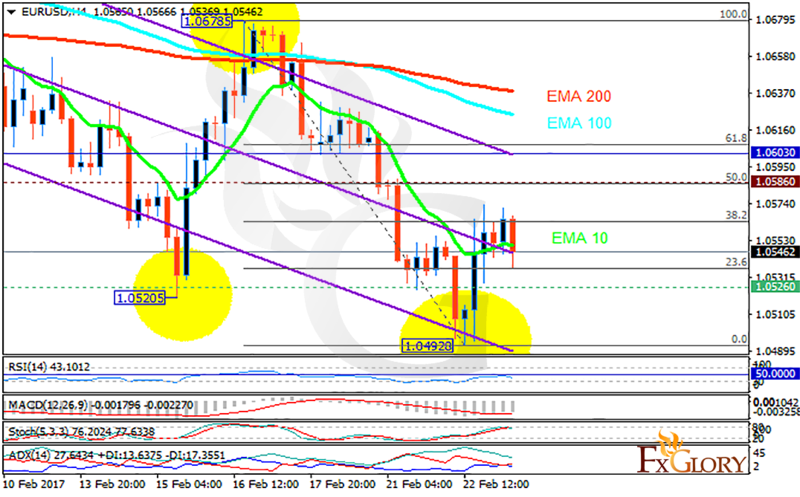 The support rests at 1.05260 with resistance at 1.05860 which both lines are below the weekly pivot point at 1.06030. The EMA of 10 is moving with bearish bias along the descendant channel and it is below the EMA of 100 and 200. The RSI is falling towards the oversold area, the Stochastic is moving in its high ranges and the MACD indicator is in negative territory. The ADX is showing buy signals. It seems that the pair has already started its bearish trend after passing 38.2 level of Fibonacci retracement therefore short positions are recommended targeting 1.0450.